Molten-salt-based nanofluids and ionic-liquid-based nanofluids are developed for thermal storage and heat transfer at relatively high temperatures, in the past few years. Preparation and stabilization techniques are briefly introduced firstly, and then, thermal properties, e.g., specific heat, thermal conductivity and viscosity, are summarized and discussed in detail. The properties are not only affected by the characteristics of nanomaterials and base fluids, but also affected by the synthesis method, such as the sonication intensity and duration. 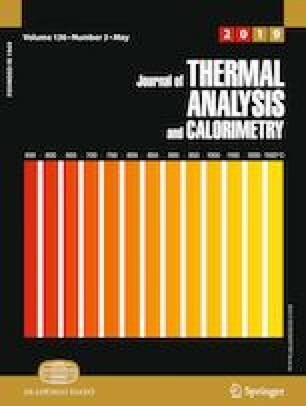 Some of the thermophysical property data are still incomplete, especially the thermal conductivity of molten-salt-based nanofluids, and properties of ionic-liquid-based nanofluids at high temperatures. 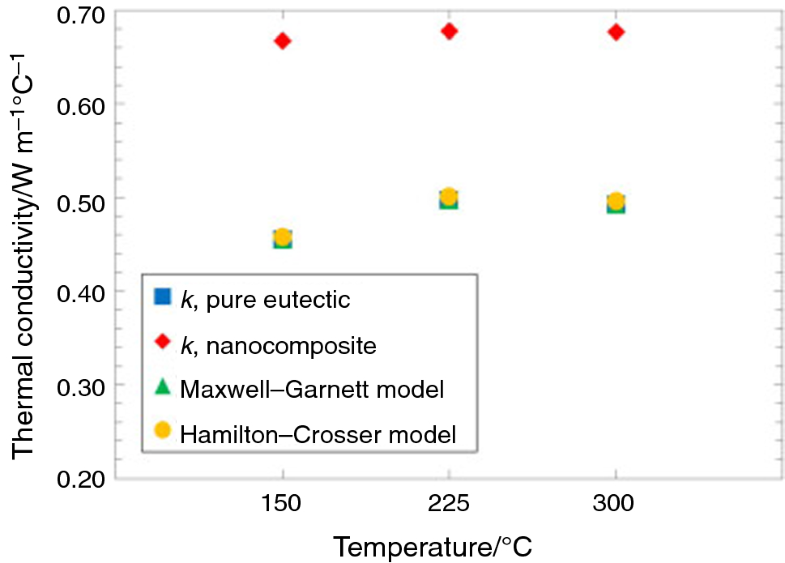 While several literature works show that the Krieger–Dougherty model can well predict the viscosity, no general models for thermal conductivity and specific heat have been developed yet for both types of nanofluids. Nanofluids (NFs) have been widely investigated in the last decades. However, they were firstly proposed by Choi and Eastman . They are solid–liquid two-phase systems where the nanosized particles (1–100 nm) are dispersed into base liquids such as water, oil and ethylene glycol (EG), and physical methods are employed to improve the system stabilization. Due to the enhanced thermal properties, nanofluids are considered as a new generation of heat transfer and thermal storage fluids [2, 3]. Effects of the base fluids, particle materials, nanoparticle (NP) size, concentrations and morphology on the thermophysical properties have been reviewed by some studies [4, 5, 6, 7]. Excellent enhancements on thermal conductivity (λ) have been reported by many works [8, 9, 10, 11, 12]. Masuda et al. measured a 30% increase in thermal conductivity by 4.3 vol% Al2O3–water NFs with 13-nm average diameter particles. Eastman et al. showed that the λ can be improved by 60% in 5 vol% CuO–water NFs  and by 40% increase of 0.3 vol% Cu–EG NF with 10 nm diameter . Moghadassi et al. reported a 50% increase in λ of 5 vol% CuO–monoethylene glycol and CuO–paraffin NFs. Murshed et al. observed a 27% increase in 4 vol% TiO2–water NFs with 15-nm-diameter NPs and a 20% increase for Al2O3–water NFs. However, most of the extremely high enhancements cannot be repeated by others. In 2009, a worldwide study was organized by the International Nanofluid Property Benchmark Exercise (INPBE). Over 30 laboratories around the world tested the same NFs using the same or different measurement methods. In fact, the experimental data did not show prominent increases on λ . Recently, hybrid nanofluids have been proposed. These have nanoparticles composed by two or more different nanomaterials. In this case, they can possess the common characteristics of the composite materials and may obtain further heat transfer enhancement with augmented thermal conductivity . However, stability is one of the biggest challenges for hybrid nanofluids, due to the larger molecular mass and the surface charge of the two different materials . However, most pervious works focused on water-based [16, 17, 18], EG-based [19, 20, 21] and engine oil (EO)-based [22, 23, 24] NFs, and these are considered as traditional NFs. The water-based and EG-based nanofluids can be only used below 100 °C and 190 °C at atmospheric pressure, respectively. The EO-based nanofluids can be used up to 400 °C, but most additives and stabilizing agents cannot withstand temperatures as high as 60 °C . Therefore, the surface modification method is employed for oil-based nanofluids , which leads to a high manufacturing cost. Many industrial applications require the working fluids at medium (100–400 °C) or even high temperatures (> 400 °C). For example, the operating temperature of working fluids in the heat collector of concentrated solar power (CSP) is usually higher than 300 °C and that of thermal storage fluids in CSP even can reach up to 550 °C [27, 28]. Due to the low cost and thermal stability, the molten salts are usually used in the CSP, but the low heat transfer rate of molten salt blocks its CSP promotion. Based on this, the silica NPs added into inorganic salt (Li2CO3:K2CO3 62:38 mol) were firstly proposed by Shin and Banerjee . They found that the specific heat (Cp) can be enhanced by up to 25%, by only 1 mass% of silica NPs of 1–20 nm size. More importantly, some molten-salt-based nanofluids (MSBNFs) can be stable without any additives. According to this idea, some follow-up studies on MSBNFs were performed and found that the enhancement of Cp in the solid phase is higher than that in the liquid phase. An ionic liquid (IL) is a special kind of molten salt with a melting point below 100 °C, which is also called room-temperature molten salt (melting point of traditional molten salt is above 100 °C) . The ILs attract a lot of attention due to the extremely low vapor pressure and thermal stability, and the properties can be designed by a suitable selection of the cation and anion. With a wide range of fluid working temperature from room temperature, it is promising for employment as a heat transfer fluid rather than traditional molten salt. Incorporation of nanosized particles with ILs was firstly proposed by Castro et al. , which also surfactant-free , and proved that it can improve the λ. The enhancement of λ increases with the increase in temperature and mass fraction of NPs. 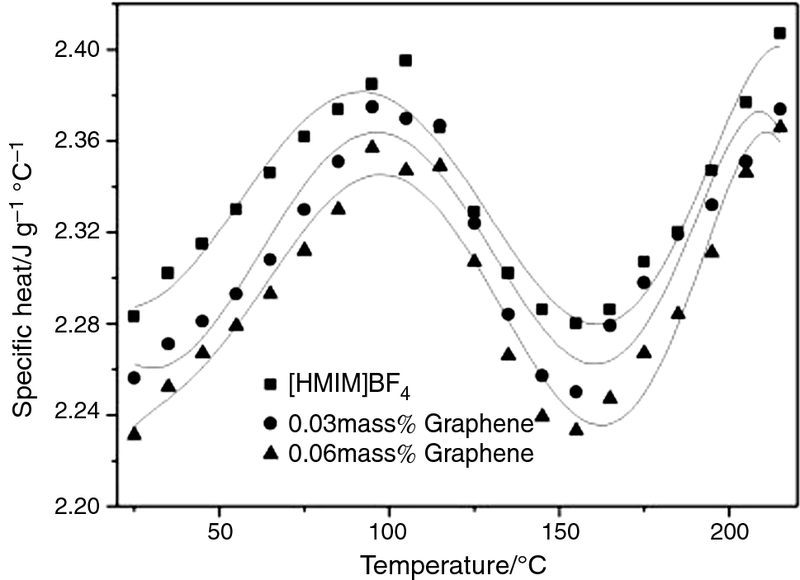 The maximum enhancement can reach 25% for graphene (GE)-[HMIM][BF4] system at 200 °C as found by Liu et al. . This article aims at an overview of the molten-salt-based nanofluids (MSBNFs) and ionic-liquid-based nanofluids (ILBNFs), which can be used at medium-to-high temperatures. The review will focus mainly on their thermal properties (Cp, λ and viscosity). The comparison of the experimental data for different NPs and base fluids should provide some guidance for future research. There are two main methods to prepare NFs: two-step method and one-step method . The two-step method is the most widely used, and the NPs are firstly dried as powders and then dispersed into the base fluid. Ultrasonic vibration, surfactants or other techniques are commonly used to disperse the particles and reduce the agglomeration. The two-step method is the most economic method to produce NFs in large scale, and nanopowders can be supplied in plenty quantities by several companies. However, there are also some shortcomings of the two-step method such as particle agglomeration during drying, storage and transportation of NPs and dispersion of NPs in the base fluids. Wang et al. found that the sonication time has a big influence on the properties of suspensions. Too short sonication time causes a high viscosity (µ), especially for high volume fractions, while too long sonication time can reduce the µ but lessen the enhancement of λ. There exists no definite guidance for various kinds of NFs. In addition, surfactants may cause a decrease in λ, and the functionality might be changed under relatively high temperatures or produce foam . In order to improve the stability and reduce the agglomeration, the one-step method was developed . It is a process that simultaneously makes NPs and disperses the NPs into base fluids, for which the NPs are directly prepared by physical vapor deposition or a liquid chemical method . In the single-step method, the processes of drying, storage, transportation and dispersion of NPs are avoided, so the agglomeration of NPs is minimized and the stability of the fluids is increased. To prevent the oxidation of metallic particles, the single-step method is always preferable for synthesizing NFs containing metal particles. The main disadvantage of the one-step method is that the cost of physical vapor deposition method to prepare the NPs is too high as well as hard to be utilized in large scale and can only be used on low vapor pressure base fluids. Using the liquid chemical method to prepare the NPs may leave residual reactants in NFs due to the incomplete reaction or stabilization and it is hard to be eliminated completely. The molten-salt- and ionic-liquid-based NFs are difficult to synthesize by this method. Many molten-salt-based and ionic-liquid-based NFs are synthesized by the two-step method or improved two-step method . Fukushima et al. found that imidazolium-ion-based ionic liquids were excellent dispersants for carbon nanotubes, which could reproduce stabilized NFs by sonification or grinding the suspensions. This method was also employed by Nieto de Castro et al. to synthesize NFs with multi-walled carbon nanotubes (MWCNTs) in ionic liquid ([C4mim][PF6]). Paul et al. dispersed the Al2O3 into four kinds of ionic liquids ([C4mim][NTf2], [C4mmim][NTf2], [C4mpyrr][NTf2] and [N4111][NTf2]) using a vortex mixer to produce NFs. 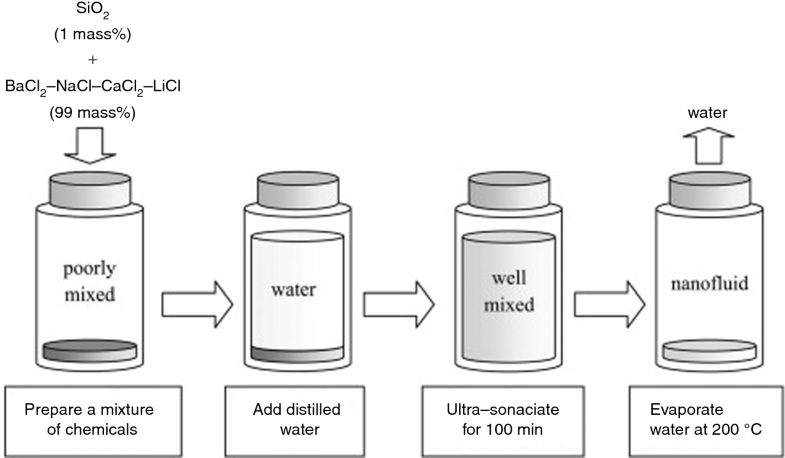 An improved two-step method was widely used for molten-salt-based NFs, which mainly includes four basic steps to complete the synthesize process : firstly, mixing the inorganic salt and nanopowders; secondly, adding a certain quantity of distilled water to dissolve the salt; thirdly, using the ultrasonic power to break the agglomerations; and finally, evaporating the water and obtaining the final sample. The above-described process is shown in Fig. 1. The method for preparing the molten-salt-based nanofluid. Due to the high surface area and surface activity, NPs tend to agglomerate by the van der Waals attraction force. The agglomeration may result in settlement and clogging in the microchannels and also have a negative effect on the λ enhancement . Thus, the long-term stability of NFs is a precondition for its analysis and utilization. There are some traditional techniques which can be used to change the surface state of NPs in order to prevent the agglomeration and obtain a stable NF. This is the most common method, easy and economic, to avoid sedimentation of NPs. Surfactants can adhere to the NPs and change its wettability and thus improve the continuity between the NPs and fluids. The surfactants are divided into four classes [34, 41]: nonionic surfactants without charge groups in its head, anionic surfactants with negatively charged head groups, cationic surfactants with positively charged head groups and amphoteric surfactants with zwitterionic head groups. However, the dispersants between the NPs and fluids can enlarge the thermal resistance, limit the enhancement of λ and increase the µ. More importantly, the most surfactants cannot withstand temperatures as high as 60 °C . It is also called surfactant-free method. Through chemical reaction, the surface of NPs can be modified by functionalization. Using the modified NPs, NFs can keep long-term stability. This can avoid the loss of λ and no increase on µ. The disadvantage is that a high accuracy for chemical reactions is needed, and it is hard to control the reaction process. This method is mainly used in the biomedical field and, still at the laboratory level, is difficult to obtain at large scale . The stability of NFs is directly related to the electrokinetic properties. The strong repulsive forces can be obtained by PH control, resulting in a well-dispersed suspension. The isoelectric point (IEP) is defined as the value of PH at which a particular molecule carries no net electric charge, or hydration forces are negligible . The NF is unstable when the PH value is nearly equal to the IEP, and different NFs have different IEPs. The suitable PH values for alumina, copper and graphite–water suspensions are around 8.0, 9.5 and 2.0, respectively . The PH for the IEP also changes with temperature variation . This method also has the limitation that the PH of NFs must be around 7, because the acidic and alkaline fluid may corrode the heat transfer surface . This is the most commonly used physical method, different from the aforementioned three methods of chemical treatment. This method does not change the surface properties of NPs, but only break down the agglomerations. It seems simple to be applied in industry, but the suspensions tend to agglomerate and clog after a period of time. Some strong disturbances can be produced by the sudden expanding and converging surfaces such as fluid acceleration, fluid impact on the wall, fluid pulsation and high shear flow (secondary and rotation flow) [47, 48, 49]. Due to the strong effect of the ultrasonic time and intensity on the properties of NFs, the method needs to be deeply studied . Due to the high-temperature preparation process and application environment, the method of additives can hardly be used, and the ultrasonic vibration is still the most common method to maintain the stability of suspensions. where φ is the nanoparticle volume concentration. Subscripts nf, np and bf indicate the nanofluid, nanoparticle and base fluid, respectively. The Maxwell model  is the first one to calculate λ of low-volume-fraction solid–liquid suspensions. It is mainly used on spherical particles; based on this, several extended Maxwell models were developed [57, 58, 59]. However, these models only considered the effect of volume fraction, and the influences of NPs shape, size, distribution, particle–particle interaction, and temperature are little considered. They are more like empirical correlations and lacking description of potential mechanisms. Later, a series of theories on enhancement of λ were put forward, including (1) Brownian motion, (2) clustering, (3) nanolayer, (4) ballistic transport and nonlocal effect, (5) thermophoretic effect and (6) near-field radiation. The first three theories were widely studied by scholars. Xuan et al. proposed a model to include the Brownian motion effect, fluid temperature and the structure of NP clusters in λ. Yu et al. proposed a modified Maxwell model by considering the nanolayer theory to calculate λ of NFs. Yamada et al. proposed a model for CNT NFs and considered the effect of radius and length of CNTs. Yang et al. proposed a thermal conductivity model for nanorod NFs by allocating the proportion of two intermediate thermal conductivities in the axial and radial directions according to the surface area ratio of the flanks and ends of the nanorod, and the interfacial layer was also considered in this model. The above models to predict λ are shown in Table 1. Pak et al. firstly proposed a model to measure specific heat of NFs in 1998. A modified model by Xuan and Roetzel  was given in 2000, which has been validated by Hanley et al. (SiO2, Al2O3 and CO2–water)  and Murshed (Al–EG, TiO2–EG and Al–EO) . The results show that the Xuan and Roetzel model can fit well with the experimental data. A new correlation was developed by Vajjha et al. , which considered the effect of temperature. However, the coefficients in the model are changed with different nanoparticles and base fluids. Pakdaman et al. developed a model to predict Cp of MWCNT–heat transfer oil and considered the temperature ranging from 313 to 343 K. Sekhar et al. proposed a correlation based on 81 experimental data of water-based NFs from the published works. This model not only considered the effect of temperature but also considered the particle size. The above models to predict Cp are shown in Table 2. A summary of µ prediction models is shown in Table 3. The most classic model for µ prediction of NFs is the Einstein model . It can only be used at low volume fractions below 2 vol%. Various modified Einstein models have been proposed by many researchers. Guo et al. 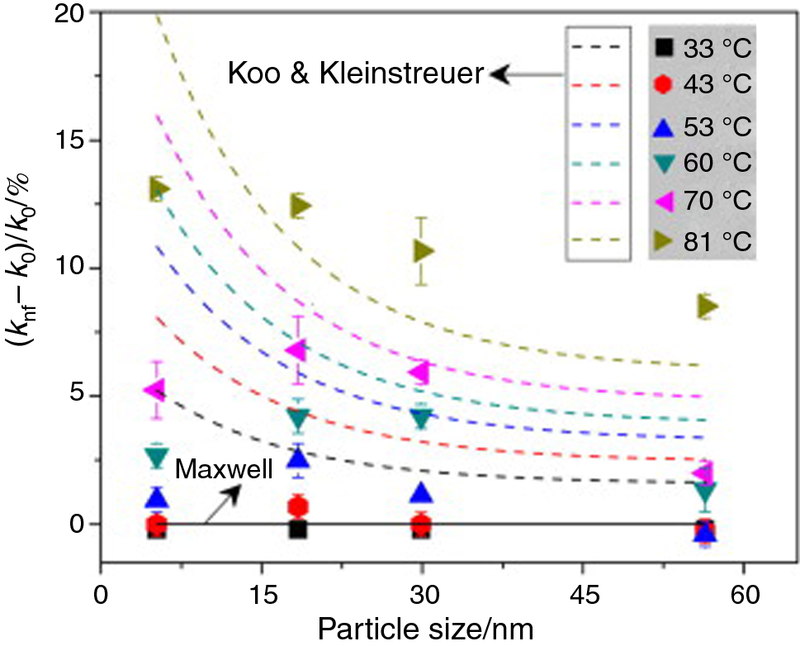 considered the particle size effect and found that the smaller particle size induces higher µ. Graham et al. considered both the particle radius and inter-particle distance. Krieger et al. proposed a correlation to fit for full coverage of particle contents and have considered the difference of µ at different shear rates. A modified Krieger–Dougherty model was presented by Chen et al. , who considered the packing volume fraction of an imaginary sphere containing clusters based on the fractal theory. Recently, a newly upgraded model based on the Chen et al. model was put forward by Selvakumar et al. by considering interfacial layers surrounding the clusters. In addition, White et al. found that temperature has a big influence on µ but few models have considered it. Although many factors have been involved in the existing models, the prediction accuracy and application range are still limited, especially as some models can only predict the corresponding kinds of NFs. The molten salt and its related NFs are mainly used as high-temperature thermal storage fluids, and the Cp has been studied by many researchers. There is a common result that the specific heat of MSBNFs is increased by the NPs, which is opposite to the traditional NFs. Several published works on Cp of MSBNFs are summarized in Table 4. Two kinds of eutectic molten salts (60%NaNO3 + 40%KNO3, and 62%Li2CO3 + 38%K2CO3) are mostly used as base fluids. The Cp for a temperature range from 250 to 420 °C (liquid phase) with various concentrations (0.5 mass%, 1.0 mass%, 1.5 mass% and 2.0 mass%) of SiO2 NPs dispersed into the solar salt (60%NaNO3 + 40%KNO3) was studied by Andreu et al. . The average enhancement of Cp is 3.41%, 25.03%, 2.00% and 3.69%, respectively, with the increase in NPs mass fraction. Moreover, Chieruzzi et al. also added the NPs (SiO2, Al2O3, TiO2 and SiO2–Al2O3) into the solar salt, with three kinds of mass concentrations (0.5, 1.0 and 1.5 mass%). They also found that the 1.0 mass% mass fraction is the optimal value for enhancement of Cp. The effective order of specific heat enhancement is SiO2–Al2O3 > Al2O3 > SiO2 > TiO2, and for the small concentration (0.5 mass%) and TiO2 are side effects to the Cp. In another work, Chieruzzi et al. found that the screw rotation speed and mixing time have big influences on the specific heat, as shown in Table 5. The enhancement of Cp in the solid phase is much higher than in the liquid phase; the maximum enhancements are 52.1% and 18.6%, respectively, with SiO2–Al2O3 NPs at the biggest screw rotation speed and mixing time (200 rpm–30 min). For another widely used eutectic molten salt (62%Li2CO3 + 38%K2CO3), Tiznobaik et al. dispersed SiO2 into molten salt and found that the particle size has little effect on the enhancement, and the growth rate for the solid phase is little higher than that for the liquid phase. Al2O3 was used by Shin et al. and compared with the Tiznobaik et al.’s  data at the same NP size and concentration (10 nm and 1 mass%). The enhancement of Al2O3-based MSBNF is higher than SiO2-based MSBNF (32% and 29%). This result was also confirmed by Tiznobaik et al. in 2015, and it was found that Al2O3 > SiO2 > MgO. Jo et al. used the graphite NP; the enhancement of Cp was similar to SiO2-based MSBNF in the solid phase, but smaller than SiO2-based MSBNF in the liquid phase. There are some special molten salts studied by Shin et al. and Ho et al. , (35%BaCl2 + 12%NaCl + 40%CaCl2 + 13%LiCl and 7%NaNO3 + 53%KNO3 + 40%NaNO2). For a comprehensive comparison, the most effective order of Cp enhancement for NPs is SiO2–Al2O3 > Al2O3 > SiO2 > GE > MgO > TiO2. For the molten salt, the enhancement of Cp for 62%Li2CO3 + 38%K2CO3 is almost independent of the temperature variation. The experiment data for 60%NaNO3 + 40%KNO3 and 7%NaNO3 + 53%KNO3 + 40%NaNO2 are very volatile with the temperature. The researches on MSBNF mainly focused on the enhancement of specific heat, and works on λ and µ marginally little published. The λ measurement of SiO2 in molten salt of lithium carbonate and potassium carbonate (62%Li2CO3 + 38%K2CO3) was performed by Shin et al. , with the NPs size in 10–30 nm (1 mass%). The enhancement of λ for MSBNF was in the range of 37–47%, at different temperatures. A big deviation between the experimental data and conventional models (Hamilton–Crosser model and Maxwell–Garnett model) was observed, as shown in Fig. 2. Ueki et al. tested λ of silicon carbide NPs in heat transfer salt (NaNO2:NaNO3:KNO3, 40:7:53 mass%). An increase of 13% was found with the particle volume fraction of 0.72 vol%, at 200 °C. The measured value was located between the theoretical upper and lower limits of NFs λ. Comparison of thermal conductivity values of the MSBNF (1 mass% SiO2 and 62%Li2CO3 + 38%K2CO3) and theoretical models. Viscosity is an important rheological property which determines the flow resistance. Literature works have considered the effect of NPs concentration and temperature. As a non-Newtonian fluid of MSBNF, the shear rate is also considered widely. Lasfargues et al. added 0.1 mass% CuO into the solar salt, which led to an increase of 10.8%, 4.7%, 12.9%, 18.3% and 14.9% at 250, 300, 350, 400 and 450 °C, respectively. However, µ decreases sharply with an increase in temperature and shear stress, which is very meaningful for applications. Jung et al. showed that the pure solar salt demonstrates a Newtonian behavior and the MSBNF (SiO2–solar salt) at different temperatures (300, 350 and 400 °C) presented non-Newtonian behavior (shear thickening behavior). For 0.5 mass% and 1.0 mass% MSBNFs, the maximum increases in µ values are 64.8% and 55.9% (at 400 °C), 51.6% and 67.7% (at 350 °C), 38.9% and 56% (at 300 °C), respectively. This indicates that the enhancement of µ is increased with both mass concentration and temperature. The µ values can be predicted well by the Krieger–Dougherty model . Experimental measurements of µ of MSBNF with multi-walled carbon nanotubes (Li2CO3:K2CO3, 62:38 molar) were taken by Byeongnam et al. , with a wide range of shear rate and nanotube concentrations (1 mass%, 2 mass% and 5 mass%). The increase in the µ values was 11%, 93% and 1130% corresponding to the mass concentrations of 1 mass%, 2 mass% and 5 mass%, respectively, with the fixed temperature of 550 °C and 1000 s−1 shear rate. The experimental data are also well within predictions of the Krieger–Dougherty model, as shown in Fig. 3a. Comparison of the relative viscosity between the experimental data and Krieger–Dougherty model. a Viscosity of MWCNT-based molten salt nanofluids at 550 °C. b Viscosity of Al2O3-based ionic liquid nanofluids at 30 °C. Recently, several experimental works have confirmed that the MSBNFs can improve the convection heat transfer coefficient significantly. Ho and Pan  tested the performances of laminar convective heat transfer of MSBNFs with various concentrations (0.016 mass%, 0.063 mass%, 0.125 mass% and 0.25 mass%) of Al2O3 nanoparticles (7%NaNO3 + 53%KNO3 + 40%NaNO2), and obtained enhancements of 6.9, 9.2, 7.6 and 11.6% of the mean Nusselt number, compared with the pure molten salt flow, respectively. Bellos et al. dispersed CuO into molten salt (60%NaNO3 + 40%KNO3) and obtained a 13% mean increase in heat transfer at the temperature range of 550–850 K with 6 vol% concentration. 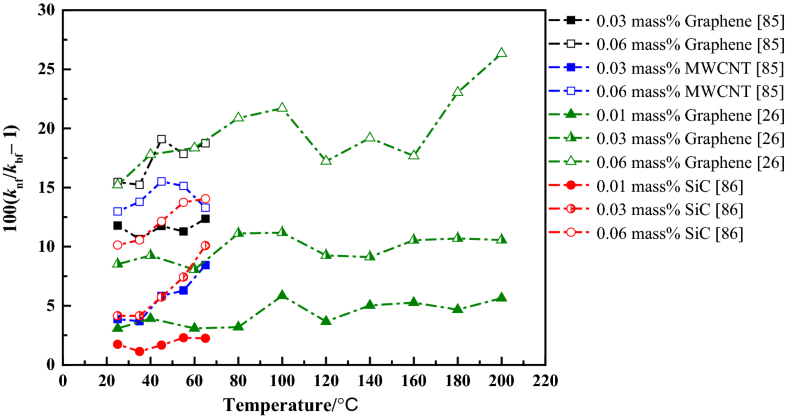 The maximum enhancement came up to 13.9% at 550 K.
Ionic-liquid-based nanofluids (ILBNFs) are expected to be used at medium-to-high temperature conditions, but most published works measured its properties below 100 °C. A summary of experimental works on thermophysical properties (λ, Cp and µ) of ILBNFs is given in Table 6. Fox et al. realized that the enhancement ratio of λ increases significantly with the increase in temperature, which is quite different from the results by Paul et al. . They found that the whisker-shaped NP (Al2O3) is more beneficial than the sphere shape. The thermal conductivity enhancement of [HMIM][BF4]-based NFs, as shown in Fig. 4, can reach up to 26%. Wang et al. and Liu et al. measured the same ILBNFs ([HMIM][BF4] + GE) with 0.03 mass% and 0.06 mass% fractions, and the results are very similar. Only Liu et al. tested data above 80 °C, and they found that the λ enhancement of the high concentration (0.06 mass%) increases with the increase in temperature, while for the low concentrations (0.01 mass% and 0.03 mass%) the enhancements are almost independent on temperature. The results by Chen et al. also showed that the enhancement at 0.01 mass% is steady, and the increase trend of SiC with 0.03 mass% is quite similar to the data of 0.03 mass% MWCNT by Wang et al. . By comparing between the experimental data from these three works, it reveals that the effective order is: GE > MWCNT > SiC. Another noteworthy thing is that these three works with very low NPs mass fractions can reach the same level of enhancement of λ, as shown in Fig. 5, and even higher than them. This is hard to explain. All the above-mentioned works have confirmed that the addition of NPs in the ionic liquid can improve λ. However, an experimental work by Fox et al. 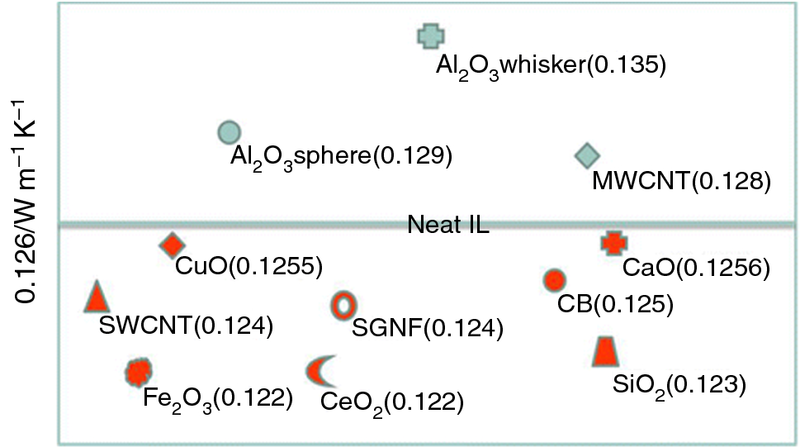 , with 11 kinds of NPs dispersed into [C4mmim][Tf2], with 0.5 mass% concentration, shows that only three nanomaterials increase λ of the base fluid: Al2O3 (spheres), Al2O3 (whiskers) and MWCNT, while others are all below the neat IL, as shown in Fig. 6. This conclusion contradicts the findings of many other scholars. Franca et al. dispersed single-wall carbon nanotube (SWCNT) and GE into four kinds of ionic liquids, corresponding to the 14.55–34.31% and 8.21–36.22% enhancement of λ, respectively. For addition of SWCNTs into the four ILs, the effective order is [C4C1im][NTf2] > [C4C1im][C(CN)2] > [C4C1im][SCN] > [C4C1im][C(CN)3]; however, by adding GE into the four ILs, the effective order is [C4C1im][C(CN)2] > [C4C1im][SCN] > [C4C1im][NTf2] > [C4C1im][C(CN)3]. The different orders are due to the different interactions between SWCNT and GE to the organic liquids. The effect of NP size was studied by Wang et al. , with the same concentration of Au (5.2, 18.4, 29.9 and 59.4 nm) dispersed into [Bmim][PF6]. The results show that the enhancement of λ increases with the increase in temperature and more significantly at high temperature. Besides, the enhancement reaches a peak value at a particle size of 18.4 nm, and the enhancement decreases obviously for the particle size above 18.4 nm, as shown in Fig. 7. This may explain the abnormal results by Fox et al. . Thermal conductivity of ILBNFs for various NPs with [C4mmim][Tf2] base fluid at 0.5 mass% and 50 °C. Thermal conductivity for different particle sizes under various temperatures for gold ILBNFs, with the same volume fraction of 0.00102%, and comparison with the Maxwell model. The Cp of ILBNFs presents interesting results according to the published works. Nieto de Castro et al. found that Cp of [C4mim][PF6] + MWCNT presents an unexpected jump within the temperature range from 350 to 400 K, as shown in Fig. 8. Liu et al. found the “jump phenomenon,” not only for the ILBNFs ([Hmim][BF4] + GE) but also for the base ionic liquid ([Hmim][BF4]), as shown in Fig. 9, and they did not give any explanation for it. Other researchers did not report the same abnormal phenomenon. Besides, Wang et al. and Liu et al. reported that the Cp values of [Hmim][BF4] + GE/MWCNT and [Hmim][BF4] + GE are lower than those of the base fluids and decrease with the increase in concentrations of NPs. There are some contradictory conclusions by Paul et al. ([C4mmim][NTf2] + Al2O3) and by Chen et al. ([Hmim][BF4] + SiC). Bridges et al. reported that the Al2O3 NPs addition into [C4mmim][NTf2] can cause a 40% increase in Cp, but a decrease of about 30% was observed for CB (carbon black) NP. The decrease in Cp for the CB NFs might be due to the increase in λ in the system, because carbonaceous materials are known to have higher λ. 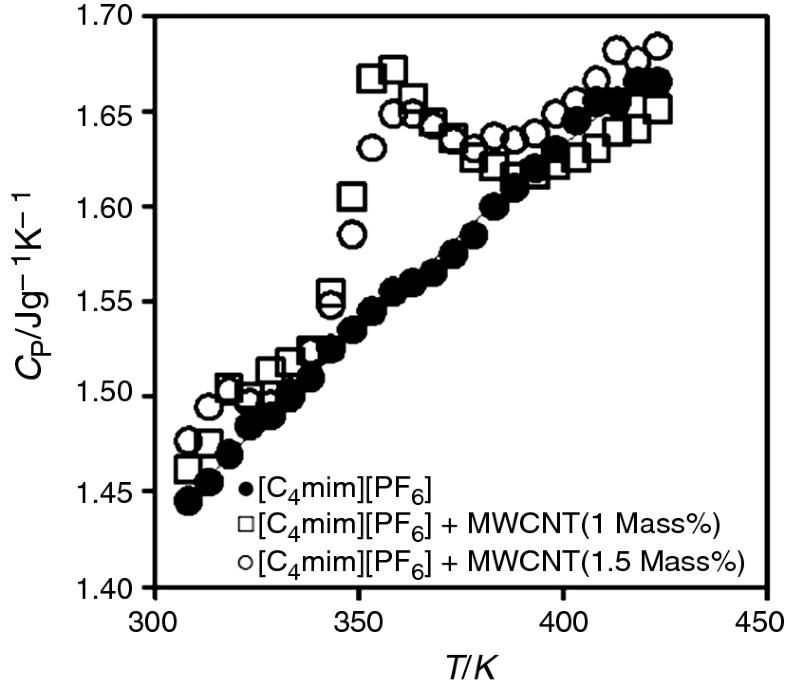 Specific heat of [C4mim][PF6]-based NFs for two different MWCNT mass fractions of 0.01 and 0.015 as a function of temperature. Specific heat of [HMIM][BF4]-based NFs as a function of temperature. The published works have confirmed that ILBNFs are also non-Newtonian fluids, and µ decreases sharply with the increase in temperature. Most experimental data indicate that µ increases with the increase in NP concentration, but only Liu et al. found that the µ is slightly decreased when adding the NPs. Paul et al. found that the Krieger–Dougherty model can also fit well with the experimental data of µ, as shown in Fig. 3b. The forced convection heat transfer of ILBNFs under laminar and turbulent flow regimes was experimentally studied by Paul , with different volume concentrations (0.18 vol%, 0.36 vol% and 0.9 vol%) of Al2O3 NPs dispersed into [C4mim][NTf2]. The convective heat transfer performance of ILBNFs increases with the nanoparticle concentration, and the enhancement of heat transfer coefficient can be up to 27% and 40% for laminar flow and turbulent flow, respectively. Minea and EI-Maghlany  also added the Al2O3 NPs (0.5 mass%, 1.0 mass% and 2.5 mass%) into [C4mim][NTf2] and compared with the regular NF (Al2O3–water). The heat transfer performances of 0.5 mass% and 1.0 mass% MSBNFs are superior to the water-based NF, but the heat transfer performance of the 2.5 mass% NF is lower than the regular BF. For future work, due to the wide variety of molten salts and ionic liquids, more systematic experimental investigations are needed. The synthesis method has a great influence on stability and measured values, so it is very worthwhile for further study. It is better to form a nanofluid synthetic protocol. In addition, more experimental data of ILBNFs at high temperatures are required. The prediction of µ needs further verification. This paper reviews thermal properties of molten-salt-based nanofluid (MSBNF) and ionic-liquid-based nanofluid (ILBNF), which can be used for medium-to-high temperature applications. The difference in preparation and stabilization techniques between the two NFs and traditional NFs is also discussed. For the MSBNF: (1) Most studies focused on its enhancement of Cp, as high-temperature thermal storage fluid or medium-temperature phase-change thermal storage fluid, due to the high boiling point. (2) For a comprehensive comparison, the effective order of specific heat enhancement for NPs is SiO2-Al2O3 > Al2O3 > SiO2 > GE > MgO > TiO2. (3) There are two most commonly used base molten salts. The growth rate of specific heat for 62%Li2CO3 + 38%K2CO3 is independent of the temperature variation, while 60%NaNO3 + 40%KNO3 is very volatile with the temperature. (4) The λ also has a significant enhancement based on the limited experimental data, and the maximum enhancement can reach up to 47%. For the ILBNF: (1) It is suitable as a heat transfer fluid, due to the low melting point. (2) The [HMIM][BF4] seems to be an effective base ionic liquid for which an addition of a very small amount of NPs (GE 0.06 mass%) can reach up to a high increase (15–26%) in thermal conductivity, within a temperature range from 25 to 200 °C. (3) An effective order of λ enhancement for NPs is GE > MWCNT > SiC based on the [HMIM][BF4] fluid. (4) The Cp of ILBNF can either increase or decrease by matching different nanomaterials and base fluids. A jump phenomenon in Cp was also observed by a few researchers, but there is no explanation for it. For the theoretical models: (1) The Cp and λ for the two kinds of NFs are not be well predicted by traditional theoretical or empirical models. (2) The µ for both NFs can be well predicted by the Krieger–Dougherty model. This study was supported by the China Scholarship Council (201706120182), the Swedish Research Council (VR) and the Natural Science Foundation of China (Grant No. 51476042).